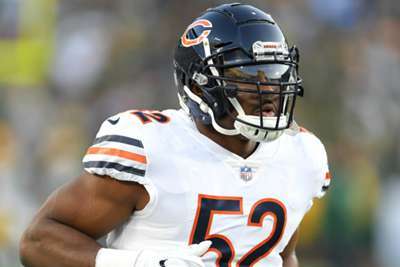 The Chicago Bears could be without star defensive weapon Khalil Mack for their NFL showdown with Tom Brady and the New England Patriots. Bears linebacker Mack is considered day-to-day with an ankle injury suffered in last week's overtime loss to the Miami Dolphins, head coach Matt Nagy announced on Wednesday. Mack was hurt in the first half of Sunday's 31-28 defeat and missed 16 snaps, though he was able to return to play with his ankle taped up. He is scheduled to undergo tests on his ankle this week to determine the severity of the injury. "We're just going to continue to keep an eye on it and be more cautious than anything," Nagy said. The Bears (3-2) are slated to host the Patriots (4-2) on Sunday.